In any country the mention of the word WAR brings up many opinions and emotions but mention “Civil War” and you get a deeper connection to it, be it via history, location or DNA. My visit to New Market, VA brought on a combination of all three. My initial plan, born out of dreams of being a photo journalist at one time, was to really give a feeling of the loss and grittiness of war in this place. 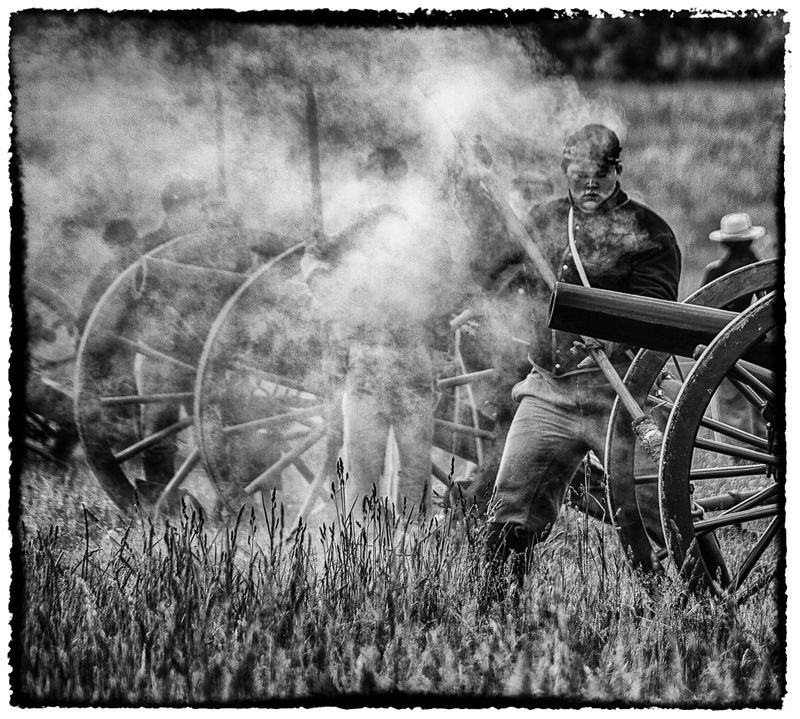 To shoot alongside the soldiers on the battlefield…. (sound of screeching tires)… I was abruptly awakened from my dream of grandeur when I had to inquire about the yellow tape and fences that seemed to prevent me from my task. A man dressed in official period garb informed me that this re-enactment was as true to what actually happened and, unless I was of period dress and carried a working camera from that time, my place would be on the sidelines. As it turned out, the sidelines rekindled in me a vision of curiosity and, with my gift of gab I proceeded to stop and question various people dressed in full period clothing. What I received was everything from, hey what kind of camera is that, to where are you from and everything in-between. This personal type of interaction forced me to envision portraits and open up my subjects to create a history lesson about the time and place. The more I shot and listened, the more this place came alive, helping me realize this battle was one of the last Confederate victories and that control of this area had to do with food to feed the vast amount of troops there and in the future. I was treated throughout the day to a living history that would have been lost within the benign pages of a high school lesson. The conversations enlightened me to the loss and courage that had occurred just yards away. Eventually the barriers melted away and vignettes appeared, punctuated by the cannon’s deafening fire. The thinking of which side one was on, quickly disappeared, once I fully immersed my self into the personal side… the side that today is only talked about and remembered after so many years of loss… the cause seems to almost disappear when the lens captures faces, actions, and sometimes even the whispers that are interwoven into a reenacted part of our history.